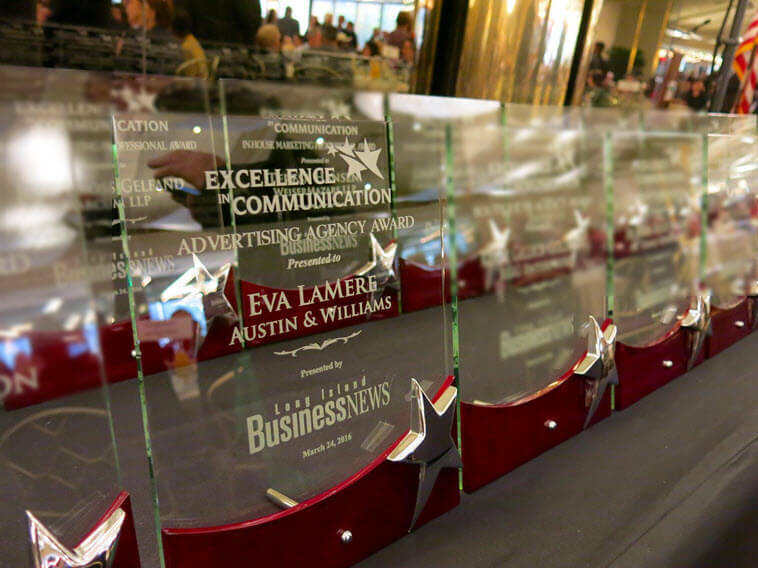 Advertising and digital marketing agency Austin & Williams recently received a regional communications award and an award for fastest growth among mid-sized companies. Agency president Eva LaMere was recognized by Long Island Business News (LIBN) with its “Excellence in Communication” Award for her leadership role within an advertising agency. The inaugural award recognizes Long Island’s top industry professionals for their excellence in marketing, communications, public relations, and website and graphic design. At Austin & Williams, Eva is responsible for overseeing the development of strategic planning for every client, as well as building and supporting a focused agency team. Her positive impact on the firm’s ability to attract and retain top-level clients throughout the years has significantly contributed to the agency’s success. The agency was also honored with a “Future 50” Award by Long Island SmartCEO for its consistent growth over the past decade as one of the top agencies on Long Island. The “Future 50” awards program recognizes the region’s 50 fastest-growing mid-sized companies that have experienced consistent growth based on a combined three-year average of revenue and employee growth. The winners will be profiled in the May/June issue of New York SmartCEO magazine.